I’ve often said that Abraham Lincoln is the most well-traveled ghost in history (I wrote an entire book about the hauntings associated with his life!) but there is no doubt that few presidents left the sort of mark on the White House that Abraham Lincoln did. His impact on the history of America has been immeasurable and in 1864, when he sought re-election, he did so with the idea that his plans were unfinished. When he was assassinated, his plans for reconciliation between the North and South were interrupted and his work was left incomplete. In fact, some would say that it remains incomplete, even today. Perhaps this is why his spirit is so often reported at the White House and may explain why he is our nation’s most famous ghost. 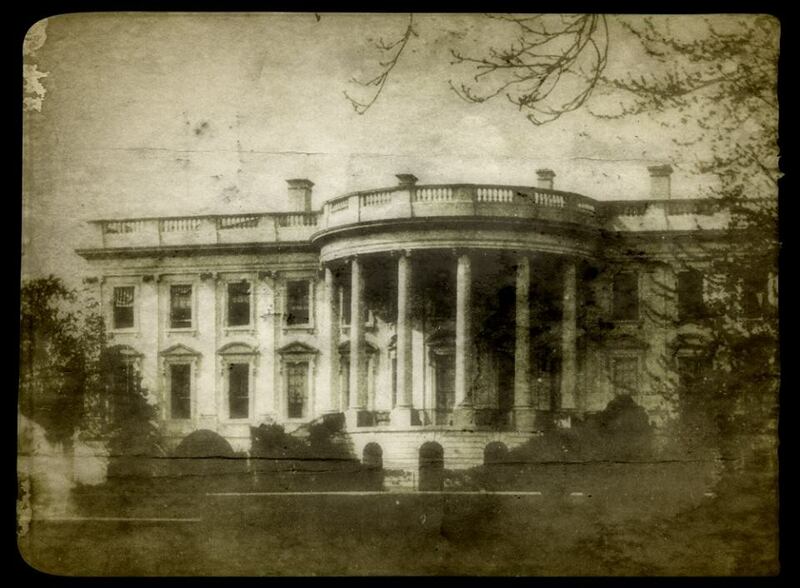 Although there are few reports of Lincoln’s specter haunting the White House of the late Nineteenth Century, there is nothing to suggest that his spirit was not present. In the years following his death, staff members and residents often reported mysterious footsteps in the hallways. However, one of the earliest reliable reports from someone who actually saw Lincoln’s apparition came from President Theodore Roosevelt, who took up residence in the house nearly forty years after Lincoln’s death. “I see him in different rooms and in the halls,” he admitted. In truth, it comes as no surprise that Roosevelt may have “attracted” the ethereal presence of Lincoln as he greatly admired the former leader and quoted his speeches and writings often. During the terms of President Calvin Coolidge, his wife Grace actually encountered Lincoln. She stated that he was dressed “in black, with a stole draped over his shoulders to ward off the drafts and chills of Washington’s night air”. She explained that one day as she passed by the Yellow Oval Room, she was startled to see Lincoln staring out the window in the direction of the Potomac, his hands behind his back. Lincoln turned and looked momentarily in her direction and then vanished. During his tenure in the White House, the room had been Lincoln’s library and he often stood at the same window, looking out with his thoughts filled with the course of the war. At that same window, Lincoln’s spirit has also been seen and felt by others, including the poet and Lincoln biographer, Carl Sandburg. He also stated that he felt Lincoln’s presence close to him in the Yellow Oval Room. President Herbert Hoover also admitted to hearing mysterious sounds in the White House. Although he never acknowledged that it was Lincoln’s ghost, Hoover left no doubt that he had heard something in the darkened corridors that he could not explain. By the time that Franklin Delano Roosevelt began his long series of terms as President, Lincoln had been dead for nearly seventy years. However, his ghost remained, unwilling or unable to leave the White House. During Roosevelt’s administration, Lincoln was at his most active, perhaps because of the concerns about the perilous state of the nation during the time of the Great Depression and World War II. Eleanor Roosevelt told reporters that she had never seen Lincoln, but she admitted that she had felt his presence late at night when she used the Lincoln bedroom as a study. She often said that she sensed him “standing behind her, peering over her shoulder”. She also admitted that she sometimes heard his “footsteps in the second-floor hallways”. Mrs. Roosevelt also told of an incident that occurred with one of her staff members, Mary Eben. Her secretary had passed the Lincoln bedroom one day and noticed a tall, thin man who was sitting on the edge of the bed, pulling on a pair of boots. She then realized that the figure was Abraham Lincoln! As the late president had been dead for about seventy-five years at the time, she was understandably frightened and she ran screaming back to her office. Mary became just one of the many people who saw Lincoln’s ghost during Roosevelt’s time in the White House, including the President’s valet, who once ran out of the mansion, shrieking in fear that he had just seen Abraham Lincoln. In addition to the residents and staff members of the White House, a number of notable visitors also encountered Lincoln during this time. One story relates to Queen Wilhelmina of the Netherlands, who spent the night in the White House during the War years, while in exile from the Nazis. It was said that she was sleeping in the Rose Room when she heard an insistent tapping on the door. As the hour was quite late, she assumed the summons must be important and she quickly opened the door. There, standing in the doorway, was Abraham Lincoln. According to a White House staff member, the Queen surprised President Franklin D. Roosevelt, and a number of cocktail party guests, the next evening when she recalled her encounter. She told them that after seeing the apparition, everything went black and she later woke up on the floor. By this time, the ghost had vanished. The late British Prime Minister Winston Churchill never discussed Lincoln’s ghost, but many believe that he may have encountered him while visiting the White House. Churchill was always quartered in the Lincoln Bedroom during his stays, as were all visiting male heads of state, but the next morning, he would normally be found sleeping in a room across the hall. He confessed that he never felt comfortable in that particular room but refused to discuss what made him so fearful of it. Of all of the presidents who encountered Lincoln’s ghost, the best known was President Harry S. Truman, who made no bones about the fact that he believed the White House to be haunted. He once recalled an incident that took place in the early morning hours, about one year after he took office. He was awakened that night by knocking on his bedroom door. He got out of bed, went to the door and opened it, but found that no one was in the hallway. Suddenly, the air around him felt icy cold but the chill quickly faded as President Truman heard the sound of footsteps moving away from him down the corridor. During his time in office, President Dwight D. Eisenhower made no effort to deny the experiences that he’d had with Lincoln’s ghost. He told his press secretary, James Haggerty, that he frequently sensed Lincoln’s ghost in the White House. One day, he explained that he was walking down a hallway and the ghost of Abraham Lincoln approached him from the opposite direction. Eisenhower took the encounter in stride --- after the horrors of war, the specter of Lincoln was probably a welcome sight. Surprisingly, Haggerty told of the President’s ghostly experience on a network television program, despite the long-held White House position on a strict “no ghost” policy. Jacqueline Kennedy, who occupied the White House with her family and husband, John F. Kennedy, exactly one hundred years after the Lincoln’s lived there, admitted that she sensed Lincoln’s presence in the mansion. Although there is no record of President Kennedy ever encountering the ghost, Jackie told reporters in 1961 that she found the White House to be “cold and drab” and disliked much of the furnishings. With this in mind, she undertook a major renovation. When she had completed the widely publicized refurbishment, the White House was freshly painted and redecorated. This is when Lincoln’s ghost began to stir again. Likely, he was unsettled by the massive alterations in the house and it was during the restoration that Jackie began to encounter his ghost. When he occupied the White House, Lincoln paid little attention to the furnishings and once was very angry with Mary when she spent too much money decorating “this damned old house”. Despite official denials, members of the first families continued to encounter Lincoln’s specter. When Gerald Ford was in office, his daughter, Susan, publicly acknowledged her belief in ghosts and made it clear that she would never sleep in the Lincoln Bedroom – or “that room”, as she called it. According to one account, Susan actually witnessed Lincoln’s spirit. The late President Ronald Reagan even mentioned Lincoln’s ghost in a 1987 press conference. He told the reporters who were gathered that he was never frightened by the spirit. “I haven’t seen him myself,” Reagan said, “but every once in a while our little dog Rex will start down that long hall, just glaring as though he’s seeing something.” He also added that the dog would bark repeatedly as he stopped in front of the Lincoln bedroom. Reagan said that if he opened the door to the bedroom and tried to get the dog to come inside, Rex would growl fiercely but refused to step over the threshold. There were no reports of Lincoln’s ghost during the Bush administration and both the President and Mrs. Bush denied seeing Lincoln or any other ghost in the White House. However, during the Clinton years, there were at least two sightings of Lincoln’s apparition. One encounter was admitted by President Clinton’s brother, Roger, who stated that he had sensed Lincoln’s presence in the White House. In the second instance, a Clinton aide admitted that he had seen Lincoln walking down a hallway but the story, which was briefly reported in the news, was quickly denied and dismissed by the White House as a joke. No reports of Lincoln’s ghost filtered out of White House during the tenancy of President George W. Bush or, but no one knows what stories will be told in the years to come. Does the ghost of Abraham Lincoln really walk in the White House? Some of our country’s most influential leaders have certainly believed so. But why does he still walk here? Is the apparition merely a faded memory of another time or an actual presence? Does the ghost appear, as has been suggested, during times of crisis, when perhaps the assistance of the president who faced America’s greatest crisis is most needed? President Harry Truman had no idea why Lincoln’s ghost was still present in the White House. In her biography about the president, Margaret Truman stated that her father certainly had no ambitions to haunt the White House himself. “No man in his right mind would want to come here of his own accord,” he said.